Efficiency in boilers, is calculated similar to other machines. In this case, useful output is the heat content in the steam. The heat content in the fuel can be calculated by knowing the calorific value of the fuel. 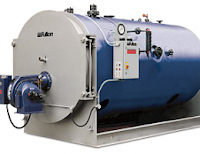 The heat content of the steam is measured by calculating factors such as the steam flow rate, steam pressure and the temperature of the feed water. Using these values, the heat content of the steam can be obtained from the steam tables.